Three major tropical storms dominated the 2017 Atlantic Hurricane season: Harvey, Irma, and Maria. These destructive hurricanes all occurred within four weeks of each other and created unprecedented challenges for coastal communities, forecasters and first responders. Fortunately, the Advanced Baseline Imager (ABI) on GOES-16 tracked these record-setting storms and supplied critical data to weather forecasters and emergency management coordinators. 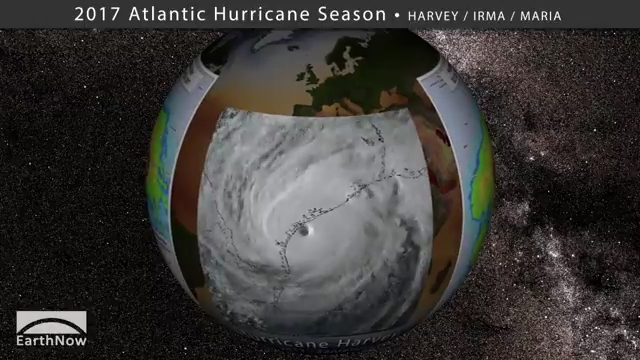 This short movie for SOS, available for preview on YouTube recaps highlights of Hurricanes Harvey, Irma and Maria featuring GOES-16 ABI imagery, plus a loop of Hurricane Harvey that includes data from the all new Geostationary Lightning Mapper (GLM).